The problem with today’s obsession over all things ‘retro’ is that it’s a cultural dead end. Middle-aged geeks continue to fawn over and “repop” variations of the painted plastics they first unwrapped 30 plus years ago, but who’s going to make amazing new stuff for their kids to enjoy with the same kind of passion? Enter Warpo Toys, a Chicago-based indie that launched its first Kickstarter last week. While the company’s owners—Bryan Katzel, Eric Lefeber, and Tommy Baldwin—are themselves toy collectors and diehard fans of ’70s and ’80s pop culture, they’re “not interested in remaking or reissuing old toys or licenses.” They aim instead “to create brand new product and tell brand new stories that haven’t been told before.” Thank the Great Old Ones! 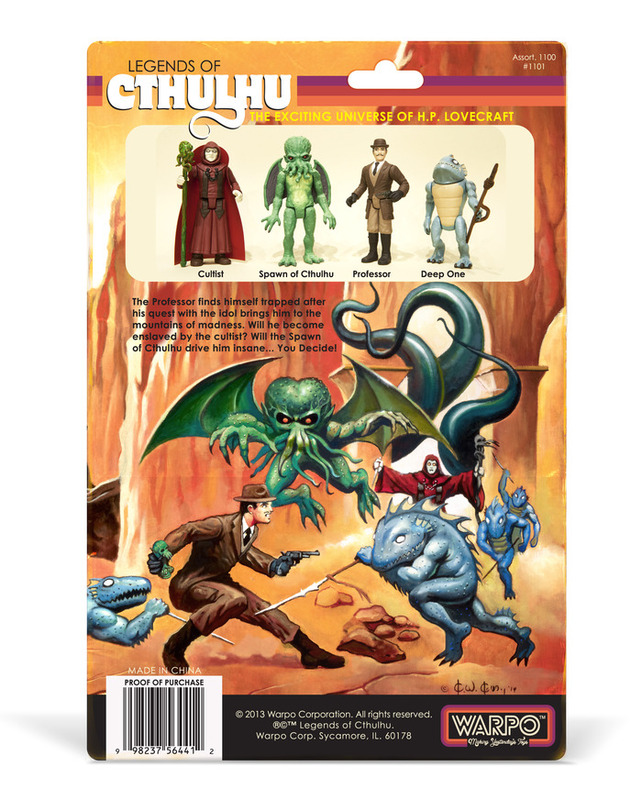 So, while the Legends of Cthulhu line is billed as retro and marketed to adults (it had to be both to get off the ground), it’s far too beautiful, literate, and original to be lumped in with the tired mash-ups and retreads on display at every con and geek-nerd-retro-comics-superhero site from coast to coast. For starters, it’s the first time anyone’s had the balls to base a toy line on H.P. Lovecraft’s Cthulhu mythos. Second, the design and execution are as brilliant as the idea itself—no small feat. And third, the narrative is just the sort of thing precocious youngsters would rally around: it’s dark, it’s supernatural; it’s full of monsters, adventure, and mystery. Actually, it’s an open-ended universe, and just the sort of thing lasting franchises are made of. Not surprisingly, Warpo’s initial Kickstarter goal of $65,000 was funded in a matter of days. As we speak, the company is just a few hundred dollars away from its second stretch goal of $90,000. Do check out the details (specs, concept art, prototypes, biographies, business philosophy) and the incredible amount of work and love the guys have already put into their potential game changer. 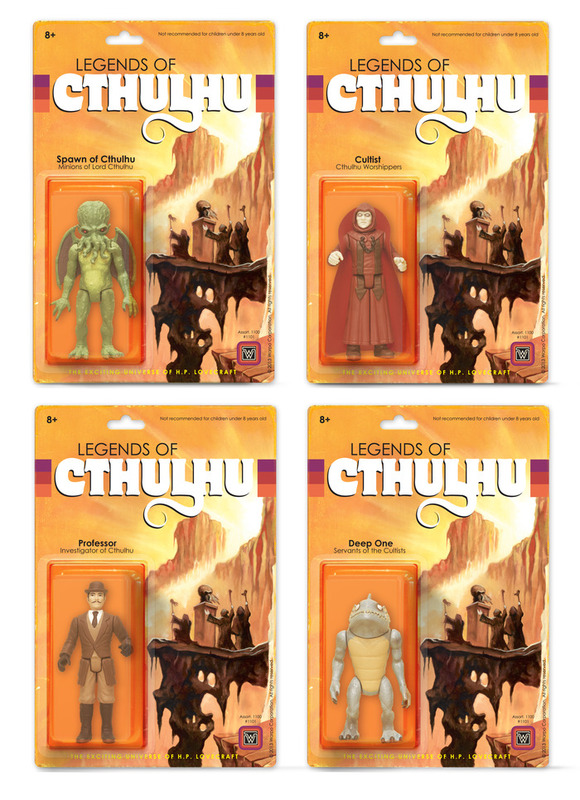 Legends of Cthulhu will be the first Kickstarter I back. It’s just a matter of how much I can afford to pledge. Oh, two more things. Eddy Mosqueda, who worked as a sculptor on the original TMNT and MOTU lines, is on the Warpo team; and the legendary Ken Kelly painted the front and back of the blister cards. Dear every major and start-up toy company today: this is how it’s done. Bow down to the cult of creativity, or face the shrieking and immemorial lunacy of cosmic irrelevance—not to mention bankruptcy. Wow, fantastic design for both the figures & the packaging. I’m pretty sure they do. Let me confirm. Confirmed. Carded figures WILL include accessories.